José Emilio Santamaría Iglesias (born 31 July 1929) is an Spanish-Uruguayan former football player and coach. He is regarded by many as one of the all-time greatest central defenders. A strong, uncompromising player, he is one of the relatively few players to star for two national football teams. Santamaría played in defence for Nacional de Montevideo and was first called up to play for the Uruguay national team for the 1950 World Cup in Brazil. He was selected to fill an inside-forward slot in the squad, but his club refused to let him join the squad on the grounds that he was a defender. Hence he missed Uruguay's second World Cup victory. Four years later though, he was an integral part of the Uruguay team at the World Cup finals in Switzerland. Convincing wins over Scotland, Czechoslovakia and England were followed by semi-final defeat by Hungary and a 3-1 loss to Austria in the third-place play off match. 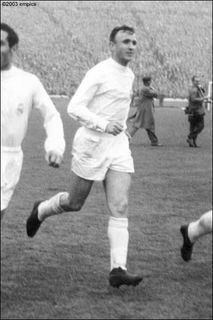 Santamaría's performance in the World Cup had been enough to attract the attention of Real Madrid, to whom he transferred in 1957. Real were dominating European football at the time, and Santamaria won three consecutive European Cup titles and the World Club Cup. He was also selected for the Spanish national team, and went on to play for them in the 1962 World Cup. This time Santamaria was to be less successful. In fact, he was dropped for Spain's final group match against Brazil, which they lost 2-1 and thus went out of the tournament. Later, Santamaría managed hosts Spain at the 1982 World Cup where they exited in the second round. Last edited by beiderbecke on Mon Jun 30, 2014 12:18 am, edited 1 time in total. I find these modifications necessary... specially with respect to response since he never presented that much reaction while defending. He was the kind of guy who waited the opponent attacker and was more prone to use his excellent physique attribute to suppress the adversary. Although his playing positioning was really world class. DEF 96 -> 95; BAL 87 -> 86; STA 87 -> 85; RES 92 -> 86; AGI 78 -> 77; MEN 88 -> 90.